Dallying In The Dirt, Issue #153 --- The coconut palms were better than the snow. It’s going to be rather difficult to get much gardening content into this issue of “Dallying.” I spent the last week on the beach in Cancun Mexico and my garden froze solid in some very cold weather back home. I do notice horticultural things even when sitting in a deck chair sipping Pina Coladas. 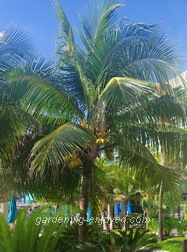 The resort and much of the surrounding area was heavily planted to Coconut Palms. 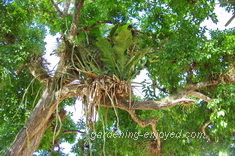 They grow quickly, have large impressive fronds and, of course, those amazing clusters of large Coconuts hanging down. Many years ago when I was wandering around the nurseries of Southern Florida, there was great concern about “Lethal Yellows” a disease of Coconut Palms that was spreading rapidly through that state. The spread of that disease made me wonder why they were so heavily planted in the Cancun area. The disease is caused by a bacterium, phytoplasma, transmitted by a planthopper. A little research indicates that the dwarf Malayan and Panama tall varieties and their interspecific hybrids, exhibit some resistance to the disease and that it is somewhat confined to certain geographic areas. The planthopper’s nymph stage lives on the roots of certain turf grasses and the elimination of those grasses in Coconut growing areas also greatly reduces the occurrence of the disease. The shorter yellow fruited trees I observed were of the Malayan dwarf type. Mystery solved, sort of. Back to the Pina Coladas. We took a couple of excursions during the week. 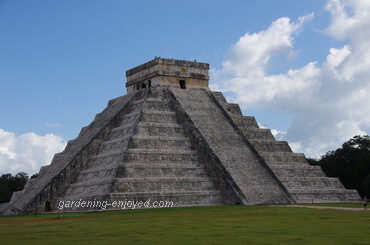 One was a return to the Mayan ruins at Chichen Itza. We last saw them about 12 years ago. They are still incredible but much more commercialized. Many more ruins have been uncovered since our last visit but many more restrictions have been added. I climbed the great pyramid on the first visit, a very tiring and scary experience but it is no longer allowed due to the deterioration from all the traffic. The swarms of local peddlers everywhere has greatly diminished the site in my humble opinion but it is still an amazing place to visit. Just contemplating the architecture that was created entirely by hand labour and their vast knowledge of astronomy and mathematics makes the modern mind boggle. I did a little horticulture around the edges, discovering the large Ferns and Bromeliads that were growing in the upper reaches of the large jungle canopy. How and why those early Mayans decided to hack away this dense jungle to build their city is an enduring mystery. One thing that is more fascinating then the tropical plant life is the coral reef and its marine life. 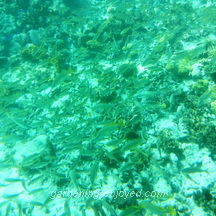 We did manage a short snorkeling excursion that also included a tour of the reef in a glass bottomed boat. The Assistant Gardener thoroughly enjoyed the boat as it gave her an opportunity to experience the reef without having to actually get in the water. The quantity of fish is always amazing as well as the multi coloured varieties. We actually saw a few large sea turtles as well. I have to admit that I ignored the underwater plant life in favour of the coral and the fish. We arrived back home to -12 C and enough snow to force us to get out the shovels. It was a bit of a tough transition but not one that elicits much sympathy from friends and neighbours. Now back to the seed catalogues. Linda Asks? For the last three years I have successfully managed to get my Poinsettia to re bloom (I am so proud of myself ) but the brackets aren't as full as when they were purchased. I there something else I should be doing beside the many hours of darkness? Ken Answers! Probably things you cannot provide such as much higher light intensity during the few daylight hours and good fertilizer program. Liz Asks? Maybe it's the wrong time of year to ask, but are the beneficial nematodes you buy for your lawn the same ones that attack garlic plants and how would you prevent the garlic nematodes from eating the garlic? Ken Answers! No. There hundreds of species of nematodes and they all have specific hosts that they feed on. The second one is a trickier question. Garlic nematodes move locations inside the garlic clove. Find a source of clean, nematode free, garlic and plant it in soil that has not had garlic planted before.